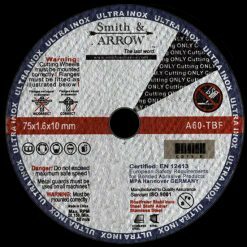 These metal cutting discs are available in 0.8mm, 1.0mm or 1.6mm thickness. Smith & ARROW Cutting Discs are Certified to Australian 5 Tick Safety Standards. Available in boxes of 25, 50, 100 and 200. Shop our product selections below.